A Christian life coach is someone who, with God’s grace will gently guide you through life’s ever changing path and make it possible for you to grow, change and discover your true self. A coach is there for support, encouragement, motivation, accountability, reassurance, and to help you unleash your untapped potential. The coach/client relationship is safe and non-judgmental in order to help you construct a plan to become who you and God would like you be. A Christian Coach will bring scripture into the coaching sessions and help you discover what direction God would have you go – who you were designed to be. Several materials are available to identify the truth within you. The good news is the answers already reside within you. A coach is there to gently walk with you as God reveals his masterpiece that is you. When we try to do this thing called life on our own, without seeking God’s advice, we inevitably end up right back where we started. This leads to anxiety and frustration. Instead, try this: “Do not be anxious about anything, but in everything by prayer and petition with thanksgiving present your requests to God…” Philippians 4:5. Are you ready to soar on wings like eagles? I believe in Jesus Christ, who is my Lord and Savior. I believe it is my duty to uphold Jesus’ teaching as found in the Holy Bible, in my own life and actions, as well as within my relationship with anyone I coach. I believe that to whom more is given, more is required. As a Christian life coach, my personal life must be completely above reproach. My actions or omissions shall never lead anyone to doubt my faith or their own. I believe it is my duty as a Christian Life Coach, to point to the Holy Scriptures as God’s inerrant plan, when my client is uncertain, confused or at a loss for direction and particularly if my client’s direction appears to be aiming away from the truth found in God’s Word. I believe my relationship with my client should be Christ-centered and client-focused, where my goal is to help my client with their God-given purpose and living true to it. I believe it is my duty to maintain the confidentiality of everyone I coach, unless information is released by the client or such confidentiality conflicts with the prevailing law or court order. Otherwise, information shall remain confidential unless it is deemed that such information could be illegal, harmful or dangerous to person or property. I will maintain integrity in all business and personal dealings; performing as I commit to perform, referring clients to others if the client’s needs do not match my competencies. I believe my sessions are to be led by the Holy Spirit, and I must be ever ready to speak the truth in love, as I am led. My goal is and will always be: personal and professional excellence. I believe, when I am weak, God is strong. With God in it, nothing is impossible! Amen. Participating in this website (E5coaching.com) to include reading, listening or viewing of videos does not equal or serve as a substitute for therapy, clinical counseling, professional advice-giving, mental health care, or treatment for substance abuse. 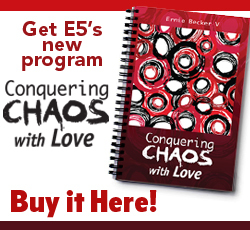 E5coaching.com and its staff are not functioning as licensed mental health professionals, and use of this website (E5coaching.com) is not intended as a replacement for counseling, psychiatric interventions, treatment for mental illness, healing from past abuse, professional medical advice, financial assistance, legal counsel or other professional services. The publishers, editors and contributors of the E5coaching.com website have used their best efforts in preparing this website’s contents. They make no representation or guarantees with respect to the accuracy, applicability or completeness of the contents of this website. Therefore, if you wish to apply any information contained in E5coaching.com, without the guidance of a licensed coach, you are taking full responsibility for your actions. The publishers, editors and contributors of E5coaching.com do not warrant the performance, effectiveness or applicability of any sites or other material listed in or linked to this website. All links and references are for information purposes only and are not warranted for content, accuracy or any other implied or explicit purpose.